The Washington, DC 2009-10 snowfall season kicked off on December 5 with a slushy mess; officially, only 0.2" of frozen precipitation was measured. This was followed 2 weeks later by a record-setting storm on the 18th-19th. The 15" on the 19th broke the December daily record, and the storm total of 16.4" pushed the monthly total to a new December record of 16.6". After peaking at 16", snow depth on the ground declined rapidly in the following week, disappearing by the 26th. Except for 1" on the 8th, January remained virtually snowless until the 30th, when 6.4" fell. The monthly total was slightly more than 1" above average. The bulk of the winter's snow total fell in February. The 3.3" on the 2nd-3rd was quickly followed by 17.8" on the 5th-6th. This storm was the 4th largest of all time in Washington and the 2nd biggest at the current National Airport location. Another 10.8" was reported in the blizzard of Feb. 9-10. The additional snow from this storm set the all-time seasonal snowfall record at all 3 major Washington area reporting locations (Washington National, Dulles, and Baltimore BWI). After peaking at 21" on the 11th, the snow coverage was slow to melt, reaching a trace on the 23rd. The 22 days with measurable snow on the ground set a new modern record for February. Following the epic amounts of the first 10 days of the month, only 0.1" of snow fell on each of the 15th and 27th. 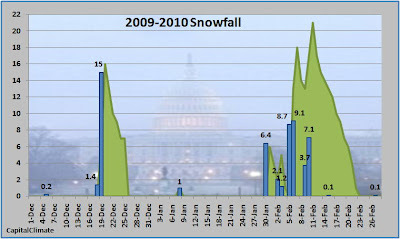 Although March snowfall in Washington is rare, it's far from unprecedented (see "Not the March of the Penguins"). 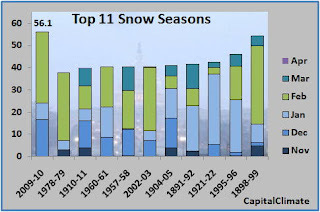 In fact, 7 out of the other 10 biggest snow seasons in Washington had significant measurable snow in March (an 8th one, 2002-03, had 0.1"). So, despite the statistical odds against it, there is still a possibility of extending the record seasonal total. Given the excessive snowfall this winter, it seems like a good time to revisit an analysis from 4 years ago on the relationship between snowfall and temperature. 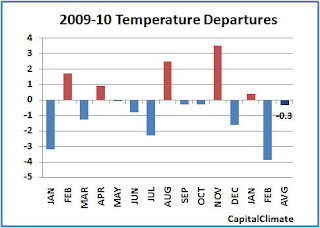 The chart to the right shows the February monthly snowfall plotted vs. the average temperature. 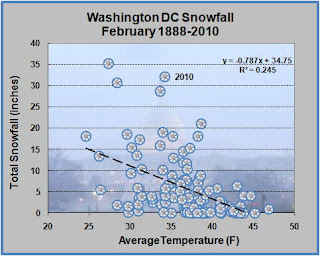 When the data for the last 6 years through 2010 are included, the relationship actually weakens: The percentage of variance in the snowfall accounted for by temperature declines from 25.1% to 24.5%. Notice how far off the trend line the point for 2010 is located. In fact, all 5 of the Februaries with snowfall over 20" are significantly warmer than their snow amounts would indicate. 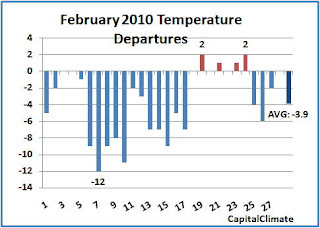 Out of the 140 years of records, February 2010 was as warm as, or warmer than, 36 of them. In other words, over 25% of previous Februaries were equal to or colder than this year's. 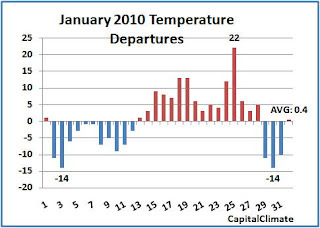 Following a very warm November, Washington, DC temperatures remained above average into the first few days of meteorological winter 2009-10 (December-February). The peak of 13° above average was reached on December 3, when 65° was observed, the second-highest of the winter. Temperatures cooled toward the middle of the month; the coldest day was the 19th at 12° below average. The coldest minimum was 23° on the 30th. December overall was 1.6° below average, the coldest since 2005, but the average of 37.9° was well above the 31.8° in 2000. A cold first half of January was counter-balanced by a warmer second half. Although temperatures turned cold again for the last 3 days, the month averaged 0.4° above the long-term mean. This made it the most nearly normal January in nearly a quarter of a century. The warmest day was the 25th at 22° above average. The day's high of 68° was the warmest of the winter, but 7° below the record for the date. The 3rd and the 30th were tied for coldest of the month at 14° below average. The lowest minimum was 16° on both the 3rd and 31st. 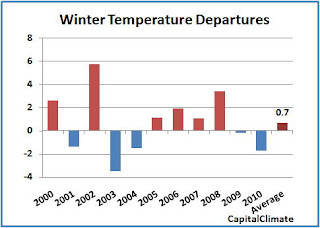 Cold temperatures persisted into February, which was the coldest month of the winter. Readings were at or below average every day through the 18th. Following a slightly warmer than normal spell ending the 24th, temperatures cooled again through the end of the month, averaging 34.2°, which was 3.9° below normal. This was the coldest February since 2007, when the average was 30.9°. The warmest days, the 19th and 24th, were each only 2° above average, and the coldest was the 7th, which was 12° below. The warmest maximum was 50° on the 21st, and the coldest minimum was 16° on the 7th. In the longer term, given that both December and February were below average, the winter overall averaged 1.7° colder than the long-term mean. 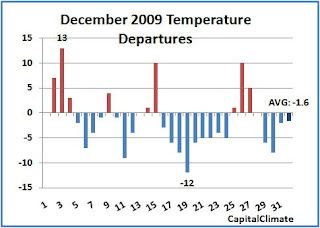 This was slightly colder than the -1.5° departure in 2004, but only half as much as the -3.5° in 2003. Including September and October, 4 out of the last 6 months since the beginning of fall have been below average. Following last winter's minimal -0.2° departure, this was the second winter in a row to be colder than average, but only the 2nd out of the last 6. Of the 11 winters so far this century, 5 have been colder than normal, but the overall winter average from 2000-2010 is 0.7° above normal.